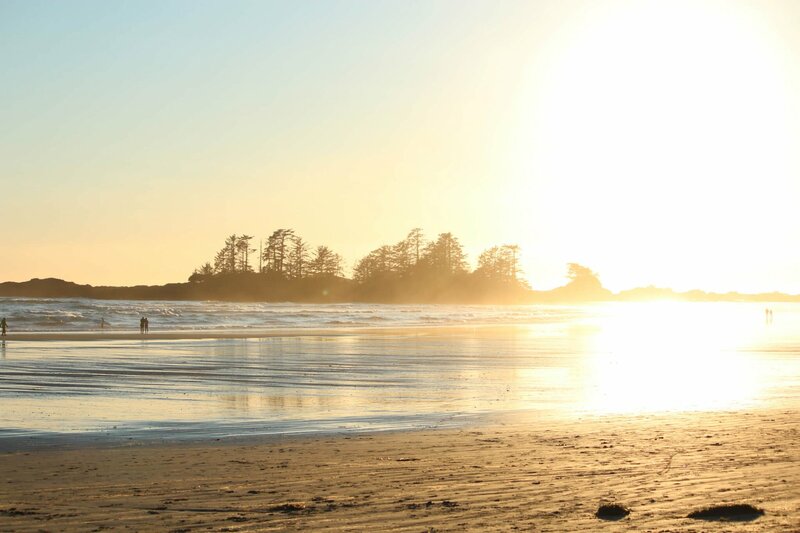 Brick House is situated on one acre of private property minutes away from Chesterman Beach, the renowned 2.7km stretch of beach with great surfing & sunsets! Brick House features 3 bedrooms and can sleep up to 6 guests. The house is perfect for families & the surfing enthusiast! Brick House by the beach is located on Lynn Road, right across the street from beautiful Chesterman Beach! The home is beautifully built with large skylights, stain glass windows and a custom one-of-a-kind wood carved front door. This spacious home features an open dining room and living room area with a fire place. Perfect for relaxing and winding down after your day spent at the beach. When not dining out at one of the many restaurants in Tofino, enjoy the gourmet and fully equipped kitchen with heated tile floors and recycled fir cabinets or grill up your favourite dish on the BBQ in the backyard. Brick House can spaciously sleep 6 guests with 3 bedrooms and 2 bathrooms. There are two bedrooms on the second floor: the master with a king bed and the second bedroom with a queen bed. The bathroom upstairs offers heated tile floors, separate glassed-in shower, jetted Jacuzzi tub and double sinks. Curl up with a good book in the lounge area upstairs which has a wood burning fireplace (a complimentary log is provided.) The third bedroom is located on the main level, with two twin beds. The second bathroom is also located on the main level with a shower. The front yard completes this home with outdoor dining furniture and a fire pit. You’ll feel right at home at Brick House by the beach! The Brick House is a 2 minute or less walk to the fantastic Chesterman Beach and is perfectly stocked with all the things you need when renting a vacation property. Our family of six loved our stay here. Our host responded quickly to our questions and the house was a great fit for our family of myself, 3 younger kids and my wife in a wheelchair and her caregiver. The house is not wheelchair accessible and nor was it advertised to be, but it is definitely “wheelchair possible”. We absolutely loved our stay in the Brick House with so much character and minutes from the amazing Chesterman Beach ... we would definitely stay here again. Beautiful property, very close to the beach. Highly recommended! All the guests who stayed in the brick house for a corporate fishing trip loved the space and it was great dealing with the hosts to set everything up as a third party! - will look to book myself soon!